For this month's Secret Recipe Club, I was assigned to Wendy's blog, The Weekend Gourmet. 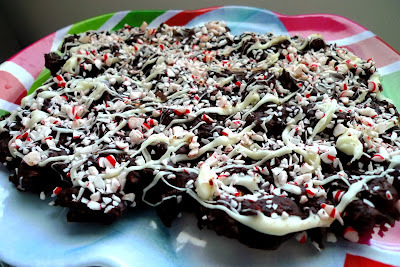 I had a lot of fun browsing through her recipes and, although I saw some tasty-looking pasta recipes, I kept finding myself drawn back again and again to her Peppermint Bliss Bark. Who can blame me? One look at hers and you'll see it's stunning. Not to mention, it's HER original recipe (genius). So, I bring you Christmas in November. This bark is so quick and easy to make. No cooking, no baking, and very little prep time. I think I whipped up the whole thing in less than an hour. In fact, the most time-consuming part of it was crushing the peppermint candies. 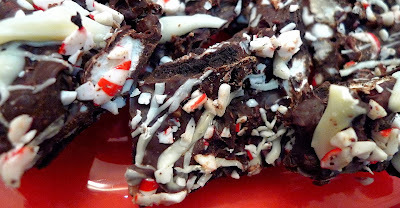 Seriously, I do not know why someone has not thought to sell peppermint candies already crushed. Bakers all over the world would be grateful. I made short work of it though by putting them in a ziplock bag, putting it onto a paper bag in my driveway, and pounding on it with the end of a small dumbbell. Whatever works, right? I did make a couple changes to the recipe. First, I tempered my chocolate so that I wouldn't have to worry about keeping the bark in the fridge to prevent it from melting. Then, instead of using mini Oreos, I crushed up some regular sized ones since that's what I had. Otherwise, it was Wendy's way all the way. 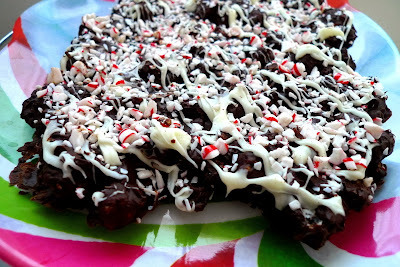 Let me tell you, this bark is perfect for the holidays. It's not only beautiful but absolutely delicious. 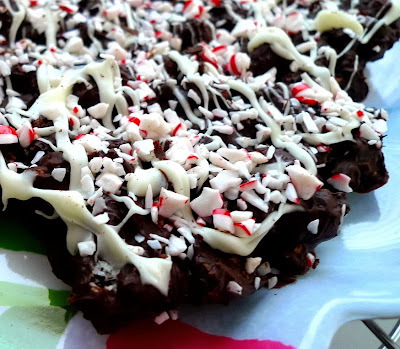 There's a little crunch from the cookies, a little chew from the marshmallows, and a lot of chocolatey-minty goodness in every bite. I loved that the peppermint flavor wasn't too overpowering and that the bark itself wasn't overly sweet like other storebought ones. I've never made chocolate bark before, but you can bet it's going to be a new holiday tradition from now on. BTW: I took some of this to work and it disappeared fast! They loved it! Thank you Wendy for giving me a great idea for Christmas. Loved the bark! Melt 1 1/2 c. semisweet chocolate chips in the microwave. Remove from the microwave and stir in the remaining 1/2 cup chocolate chips until completely melted. Add mini marshmallows, Oreos, and 1/2 cup peppermint pieces. Stir gently to combine. 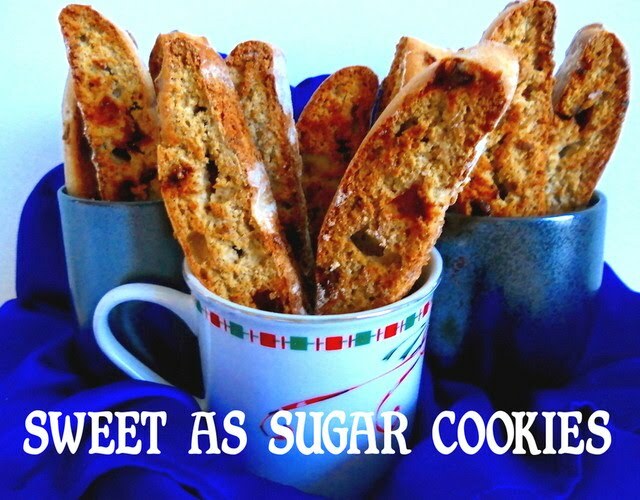 Spread the mixture evenly on a parchment paper lined baking sheet. Melt the white chocolate chips and drizzle over the top. 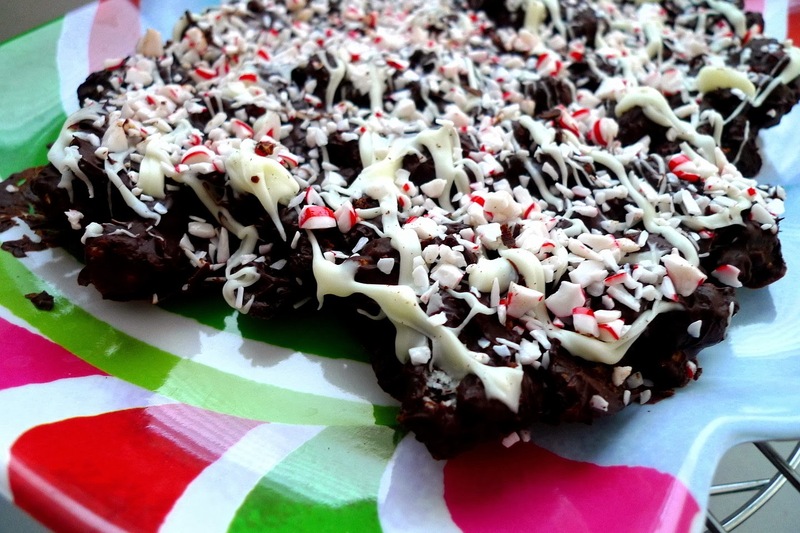 Sprinkle with the remaining 1/2 cup peppermint pieces. Place in the fridge to help it harden quicker. Once it's hardened, it can be stored outside of the fridge.